For a bit of traditional style in your bathroom, choose this beautiful vanity. Add a classic feel to your bathroom with this simple vanity set from Wyndham Collection. Enjoy the popular traditional look in your bathroom with this beautiful vanity. Its beige tan marble counter and brown solid wood base will look beautiful in your home. This simple vanity set from Wyndham Collection will fit right into any bathroom decor. This vanity is a great way to add traditional style to your bathroom. Made with a special brown solid wood base and a beige tan marble counter, this piece will make your bathroom look even nicer. This simple vanity set from Wyndham Collection will fit right into any bathroom decor. Acclaim 72-inch W 6-Drawer 4-Door Vanity in Brown For a bit of traditional style in your bathroom, choose this beautiful vanity. Add a classic feel to your bathroom with this simple vanity set from Wyndham Collection. 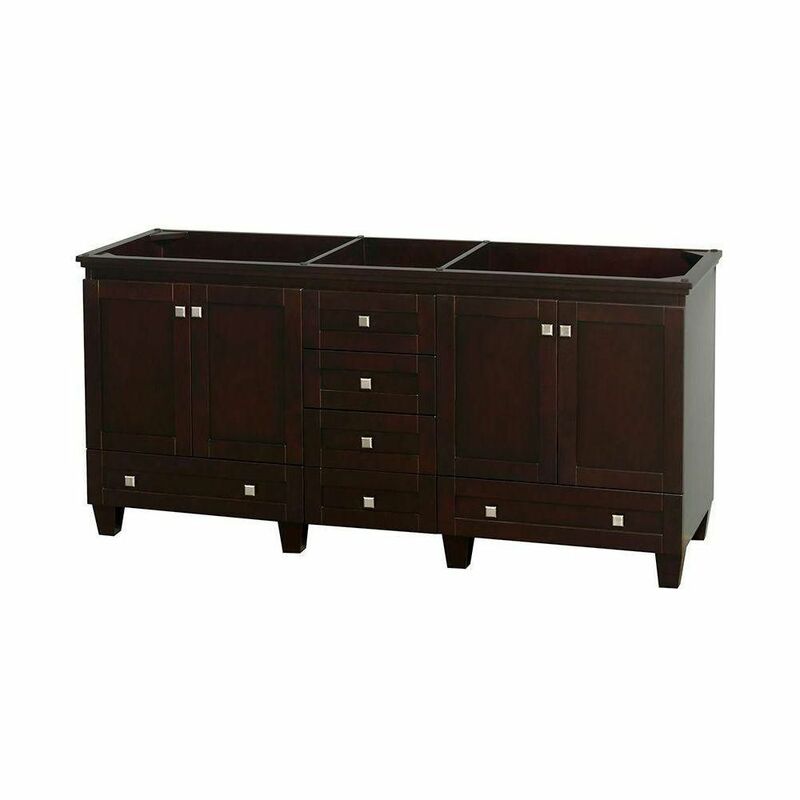 Acclaim 72-inch W 6-Drawer 4-Door Vanity in Brown is rated 4.7 out of 5 by 3. Rated 5 out of 5 by review from just gorgeous and love all the soft close drawers. Rich expresso color and we had a beautiful dar... just gorgeous and love all the soft close drawers. Rich expresso color and we had a beautiful dark green and pearl granite top made. Delivery well packaged and no assembly. Love brushed nickel hardware. Just completed our master bath re-model. Rated 5 out of 5 by Shyguy4550 from I ordered this vanity due to great reviews and features. Originally slated for delivery July 24th... I ordered this vanity due to great reviews and features. Originally slated for delivery July 24th, it arrived the 14th...10 days early! On inspection, it was in excellent condition, beautiful finish and soft-close hardware. I like the extra drawer on the bottom, more usable space. Only minor issue, the drawer/door bumpers are flimsy and ill fitting. I removed them, cleaned the glue residue with rubbing alcohol and installed good quality clear bumpers. Minor fix and worth it for the solid wood and quality construction of this vanity.